At Sundance Methadone Treatment Center, we appreciate how difficult it can be to face addiction alone. We are committed to providing our patients with methadone maintenance treatment for addiction to heroin and other opiates, and to help you every step of the way. 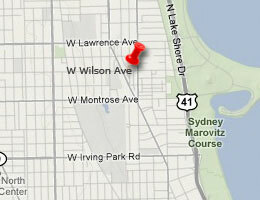 Sundance Methadone Treatment serves the North side of Chicago and the Ravenswood neighborhood. We are here to address your challenges without prejudice and judgment, and with the professionalism and care that you deserve. The understanding that addiction itself is a treatable illness is an important step in the process towards recovery. Millions of Americans struggle with addiction but sadly very few receive or even seek treatment. Long-term recovery from the physical and psychological dependence on opiates is possible, and at Sundance Methadone Treatment Centers, we are here to help our patients in the Ravenswood neighborhood on Chicago’s North side. Review the treatment options that are available to you for addiction to heroin and other opiates, and contact or call us at our Ravenswood location today for answers to your questions, and to take the first step towards recovery. Treatment for opiate addiction is a collaborative process, and we work with you on an individual basis to tailor our support to each person. Left untreated, abusers of opiates suffer deteriorating physical and mental conditions, and often premature death. We want to help you today – contact Sundance Methadone Treatment Center in Ravenswood.